MANILA, Philippines – The November 2017 Agriculturist board exam results including the full list of passers, top 10 examinees, top performing schools, performance summary of schools, among other related announcements are available at this website as PRC releases the results online on December 7, 2017 or five (5) working days after the last day of board examination. As announced, 2,883 out of 7,537 successfully passed the exams. The November 2017 Agriculturist licensure exams are administered by PRC Board of Agriculture headed by its Chairman, Dr. Fortunato A. Battad and its members, Dr. Nora B. Inciong, Inv. Gonzalo O. Catan, Jr. and Mr. Vicente L. Domingo on November 28-30, 2017 at PRC testing centers in Manila, Baguio, Cagayan De Oro, Cebu, Davao, Iloilo, Legazpi, Lucena, Pagadian, Tacloban, Tuguegarao and Zamboanga. According to the Commission’s Resolution No. 2016-1019 series of 2016 entitled “Schedule of Licensure Examination for Year 2017”, the target release date of November 2017 Agriculturist board exam result will be in five (5) working days after the last day of board examinations or by December 7, 2017 (Thursday). However, results may also be released earlier or later without prior notice. On the same exams conducted by PRC on April 2017, results were released after four (4) working days. On October 2016, results were out in five (5) working days while on April 2016, results were published after four (4) working days. The schedule of online appointment for issuance of Professional ID and Certificate of Registration will start be from December 27-28, 2017. The three-days Agriculturist board exam covered topics from Crop Science, Soil Science, Crop Protection, Animal Science, Agricultural Economics & Marketing and Agricultural Extension & Communication. Agriculture is one of the programs with huge number of examinees being administered by PRC. On the most recent Agriculturist board exam conducted April 2017, 927 out of 2,938 examinees successfully passed. Merie Joei Nable Magno from Central Luzon State University topped the exams garnering 86.17% rating followed by Richie Daliva Miguel from Mindanao State University in General Santos City having 86.00%. During October 2016 of the same exams, 1,790 out of 5,795 examinees passed. University of the Philippines Los Baños (UPLB) was the top performing school having 122 out of 126 examinees passed. Arriz Lansangan Cabigting from Pampanga State Agricultural University and Roselle Estera Madayag from UPLB ranked first garnering 85.83% rating. On June 2015, 1,888 out of 6,080 passed the Agriculturist Licensure Examination. UPLB was the only school in the top performing schools' list having 71 out of 72 examinees passed or an equivalent 98.61% overall passing rate. Julius Caesar Masi Amoyen from Don Mariano Marcos Memorial State University - Bacnotan ranked first in Agriculturist board exams garnering 87.00% rating. He was followed by Rohilyn Bertillo Egle from UP Los Baños having 85.67% and Bernadith Tartado Borja from University of Southern Mindanao - Kabacan having 85.50% rating. Meanwhile below is the summary of Agriculturist board exam results in the last four (4) years. 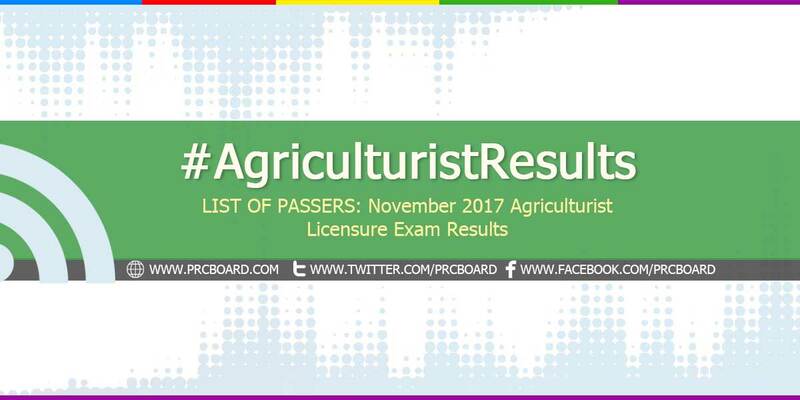 To receive up-to-date news on full results of November 2017 Agriculturist board exams, we advise our visitors to bookmark this page, visit PRC official website or follow us at our social media pages via Facebook and Twitter. kelan ba ilalabas ang result? 30 times na ako nagchecheck.